The bird life on the Lakes in Copenhagen is surprisingly plentiful and diverse. 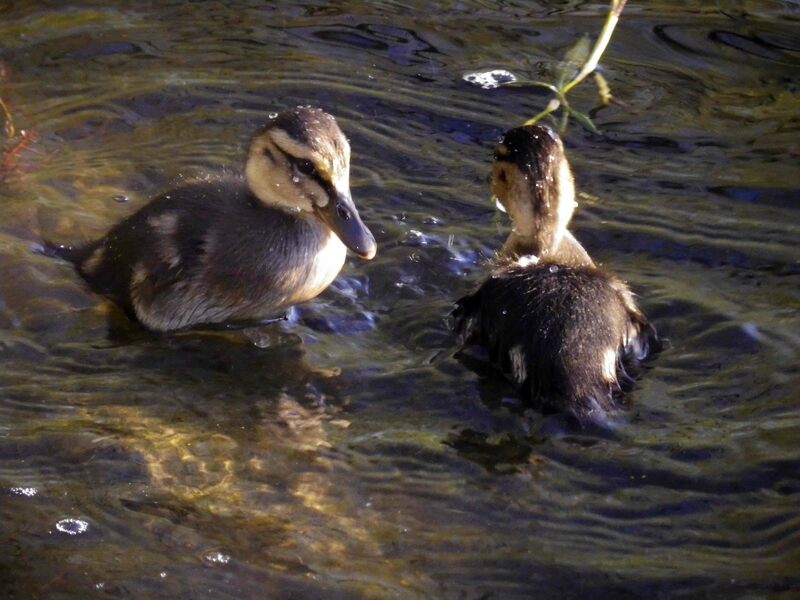 Each time we walk around the lakes we notice new nests or – even better – new tiny baby birds in the coot’s nest, striped young ones on the back of great crested grebe or ducklings paddling with their mallard parents. If the weather is good, we stop to watch their funny antics and take photos. 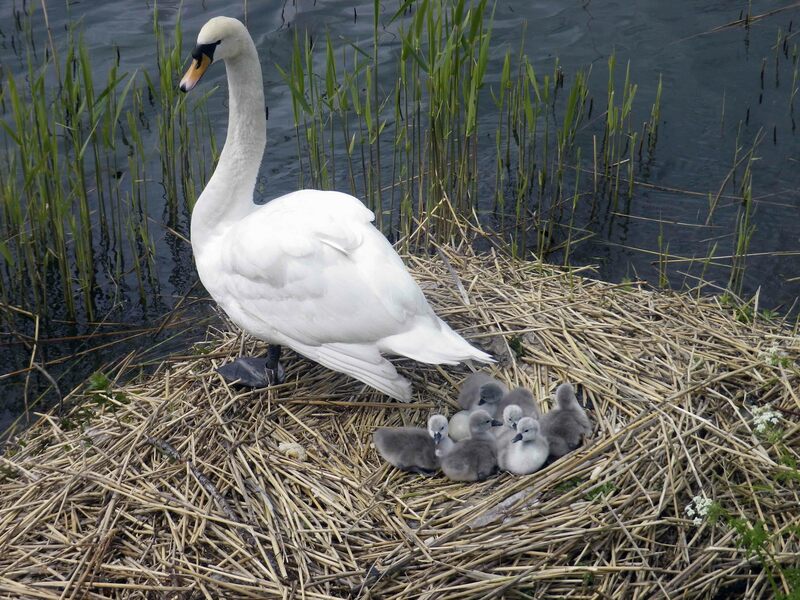 Today, mother swan was busy with six little grey cygnets, fussing to add feathers and other warm materials to the remaining grey-green egg. With spring comes new life, fresh and full of opportunities. It gives me moments of unbridled joy, following this happy addition to the abundant bird life in the middle of Copenhagen. Moments, I say, for even focussing hard on the cuteness of the baby birds as I sit here in front of the computer in the apartment, I cannot conjure and recreate the happiness I felt discovering six little grey cygnets. Paul Watzlawick’s small book, The Situation Is Hopeless, But Not Serious – The Pursuit of Unhappiness (1983) challenges the perspective that constant happiness is the object. Though decades have passed since publication of this exposition of how to excel at being unhappy, it is no less relevant in 2015: we have refined the cultural expectation we can, with deliberate action, arrive at some happiness Nirvana. This misunderstanding needs challenging like never before. Man is unhappy because he doesn’s know he is happy. It’s only that. That’s all, that’s all! If one finds out, one will become happy at once, that minute. In between Dostoyevsky’s too-simple-to-be-true antidote to human misery, Watzlawick explains how to sustain that misery with such irony that one sometimes forgets the double psychology. Most people will recognise their own modus operandi in the examples and – perhaps – be provoked to change that practice. To find inspiration for my writing, I have been looking a lot to my past, conjuring up memory of situations, dilemmas, smells, words, expressions, feelings, guilt to build drama, scene and characters. However, remembering one’s past can be a trap – either because you yearn for a glorified past with untamed nostalgia, or you let your inner cinema run amok and reawaken trauma and guilt associated with episodes long past and forgotten. While my past remembering is part of my home-coming journey of discovery, I take heed at Watzlawick’s warning. There is no reason to sustain misery from recalling the past: exactly the opposite was the point with my pied-à-terre. Many happiness manuals advise the reader to be true to themselves. Watzlawick points out this can be achieved simply by insisting on living in conflict with the world so as to stay true to yourself. The fact that someone suggests a course of action is enough reason to reject it. Indeed, maturity could be defined as the ability to do something even though your parents have recommended it. Insisting on my way or the highway is a great way to feel bad about yourself. The antidote is openness and compromise. Incredibly cute ducklings. Will they too become teenagers unable to take their parents’ advice? Photo: Mick. 2015. Which leads to the closed and uncompromising communication technique of Illusion of Alternatives, where you ask a question with only one answer. Watzlawick asserts that a certain skilled group of people, Relationship Demolition Experts – RDEs for short – excel at this technique. A husband might ask what his wife thinks of dinner, which he cooked from a new recipe. The wife might find the food ghastly (the object of the conversation), but is more likely to not want to hurt him and say it is nice (the relation-preserving response). Then she might find him making it over and over again. The Illusion of Alternatives can also be utilised the end of a great big long internal dialogue where the RDE makes assumptions about the rejection of a yet-to-be-made request and plays these assumptions out to their ultimate conclusion. In severe cases, the other might be confronted with allegations, the result of the RDE’s insecurity and consequential internal dialogue. When the other is dumbfounded or rejects the allegation, this just serves as further proof of how the assumptions of rejection were true. If confrontation is not your style, you may excel at reality testing avoidance. Reality testing could prove your assumptions wrong. If you find yourself paralysed by fears, risks and dangers, reality testing avoidance can ensure you stay in that paralysis. A man was flailing his arms and shooing. Another came past and asked him what he was doing. “I am chasing elephants away”, he said. “But there are no elephants here?” “See!” concludes the man, validated and justified in his behaviour. Humans use our great big brain – that bowling ball sized brain full of genius potential – to do a lot of self-harm. We tend to overthink things when we should just be. Intellectually we realise happiness is a momentary state, but we set out to achieve it constantly and become unhappy because we cannot. Insisting on happiness is like using black paint to brighten up the picture: the more you add the darker it gets. When I look at the birds on the lake, I know they do not ponder whether they are loved or likeable, or even how they can become happy. They exist in their cycle of feeding, growing, breeding and dying. That they exist – right here in urban Copenhagen – gives me moments of happiness that I treasure. The great crested grebe carries its young on its back. This one is getting a tad large for such luxury. Photo: Mick. 2015. 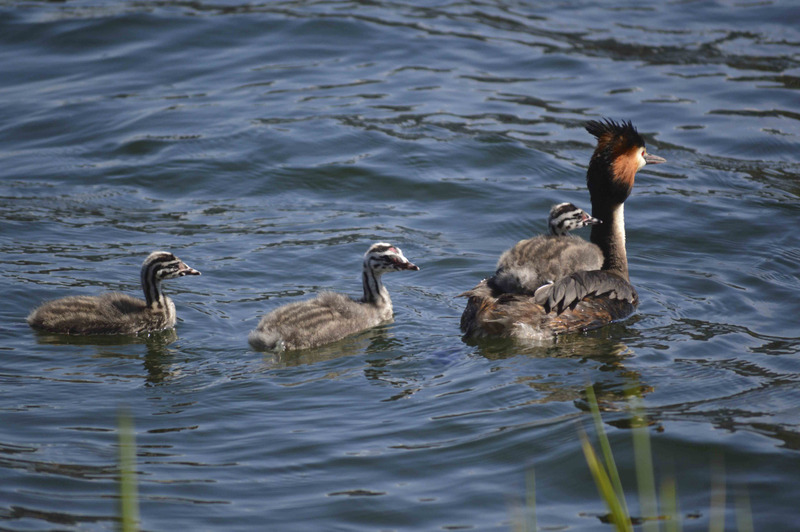 This entry was posted in Memory, Reading and tagged birds, Copenhagen, Dostoyevsky, great crested grebe, happiness, Memory, Paul Watzlawick, spring, writing on May 18, 2015 by lonebonekaffekone.